Life table analysis is a classic tool to analyze occurrences of an event through time. 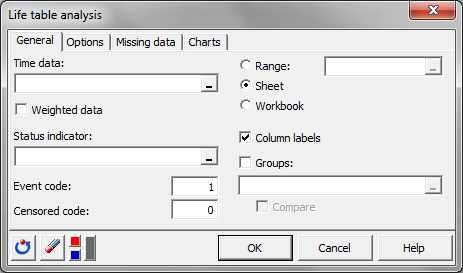 It is available in Excel using the XLSTAT add-on statistical software. Life table analysis belongs to the descriptive methods of survival analysis, similarly to the Kaplan Meier analysis. The life table analysis method was developed first, but the Kaplan-Meier analysis method has been shown to be superior in many cases. Life table analysis allows to quickly obtain a population survival curve and essential statistics such as the median survival time. 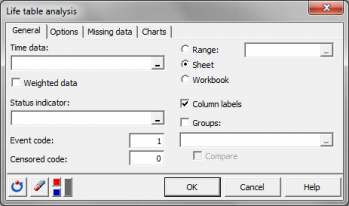 Life table analysis, which main result is the life table (also called actuarial table) works on regular time intervals. This is the major difference with the Kaplan Meier analysis, where the time intervals are taken as they are in the data set. some other go out of the surveyed population because they get healed (repaired) or because their trace is lost (individuals move from location, the study is terminated, among other possible reasons). The first type of data is usually called failure data, or event data, while the second is called censored data. The life table method allows comparing populations, through their survival curves. For example, it can be of interest to compare the survival times of two samples of the same product produced in two different locations. Tests can be performed to check if the survival curves have arisen from identical survival functions. These results can later be used to model the survival curves and to predict probabilities of failure. Left censoring: when an event is reported at time t=t(i), we know that the event occurred at t * t(i). Right censoring: when an event is reported at time t=t(i), we know that the event occurred at t * t(i), if it ever occurred. Interval censoring: when an event is reported at time t=t(i), we know that the event occurred during [t(i-1); t(i)]. Exact censoring: when an event is reported at time t=t(i), we know that the event occurred exactly at t=t(i). Simple type I: all individuals are censored at the same time or equivalently individuals are followed during a fixed time interval. Progressive type I: all individuals are censored at the same date (for example, when the study terminates). Type II: the study is continued until n events have been recorded. Random: the time when a censoring occurs is independent of the survival time. At risk: Number of individuals that were at risk during the time interval. Events: Number of events recorded during the time interval. 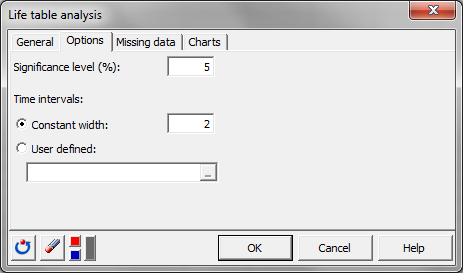 Censored: Number of censored data recorded during the time interval. Effective at risk: Number of individuals that were at risk at the beginning of the interval minus half of the individuals who have been censored during the time interval. Survival rate: Proportion of individuals who "survived" (the event did not occur) during the time interval. Ratio of individuals who survived over the individuals who were "effective at risk". Conditional probability of failure: Ratio of individuals who failed over the individuals who were "effective at risk". Standard error of the conditional probability. 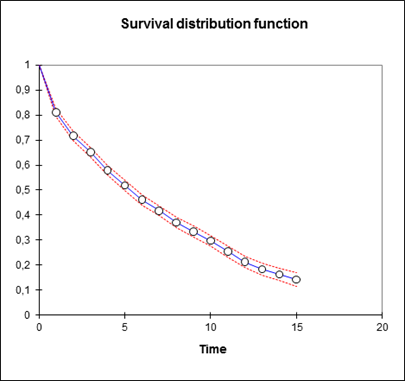 Survival distribution function (SDF): Probability of an individual to survive until at least the time interval of interest. Also called survivor function. Standard error of the survival function. 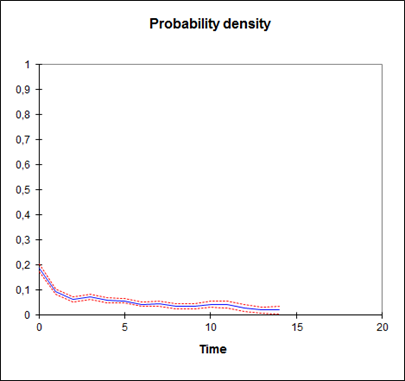 Probability density function: estimated density function at the midpoint of the interval. Standard error of the probability density. 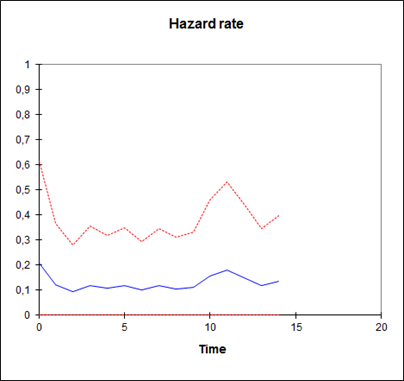 Hazard rate: estimated hazard rate function at the midpoint of the interval. Also called failure rate. Corresponds to the failure rate for the survivors. Standard error of the hazard rate. Median residual lifetime: Amount of time remaining to reduce the surviving population (individuals at risk) by one half. Also called median future lifetime. Median residual lifetime standard error. -Log(SDF) corresponding to the –Log() of the survival distribution function (SDF). Log(-Log(SDF)) corresponding to the Log(–Log()) of the survival distribution function. It is also possible to identify on the charts the times when censored data have been recorded. and the Tarone Ware test. These tests are based on a Chi-square test. The lower the corresponding p-value, the more significant the differences between the groups.